Located in the vibrant heart of downtown Victoria, the Queen Victoria Royal leaves nothing more than five minutes from your fingertips. 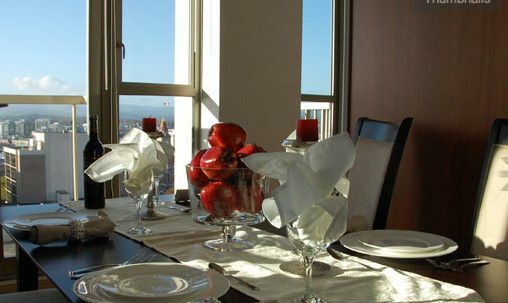 Stunning 360° rooftop views of the ocean horizon, Victoria's Historic District, China town, Antique Row and exquisite cathedrals built by European explorers first to discover the wild beauty of British Columbia. Spend your days absorbing the sunny coast while touring Centennial Square, Jazz Fest and the many other spectacular events of the Season. All while the art of local musicians echo over the magnificent Pacific Ocean. Excite the night with breathtaking walks across Dallas Beach. Enjoy Market Square and live entertainment at the Inner Harbor lit up by the Parliament buildings wrapped in Sparkling lights. Wind down your evening with drinks and dinner at one of our many lounges, jazz clubs, five star restaurants or on the private roof top with a barbecue dinner, while you relax at home in the rooftop Zen garden embracing the view of the city, the spectacular sunset symphony of colors and its private theater. Meditate to the music of the city night. Day trip by sail to Seattle on the Clipper, Helijet to Vancouver or ride to Toffino. Or maybe you could just relax right here and enjoy the endless possibilities waiting right beneath your balcony. Radie took great care of us. Cleaning Fee of $105 and 15% taxes will apply Extra person fee of 20 per person per night after the first 2 guests.